This will build on the work that the neurological and chronic pain community have undertaken over the previous five years. 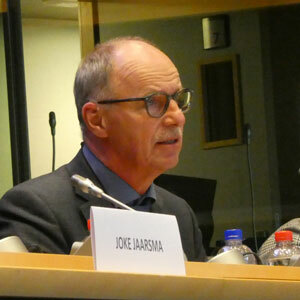 Jaarsma explained that the focus of the meeting is on fighting discrimination at work. She stressed that the level of stigma associated with brain, mind and pain disorders is very serious and can influence employment opportunities, which is why stigma and isolation seriously affect work. She added that a large percentage of the costs of these disorders can be attributed to the loss of employment and associated social welfare costs – as well as absenteeism and presenteeism of those affected and/or their informal carers. It is important to understand that by keeping people at work longer, we can reduce the economic impact – but also improve the quality of life of those affected. In this regard, EU policy can help to put structures in place to ensure that our employers and our workplaces are better equipped to recruit, retain or reintegrate people affected by neurological disorders and chronic pain conditions. She then handed over to the host MEP, Jeroen Lenaers who she congratulated on recently receiving the EFNA Neurology Advocacy Award for Young Policy-Maker. Lenaers started by recalling a pain box campaign from several years ago, where he could experience first-hand the physical sensation of chronic pain. It made him more interested in this field. He added that from his personal standpoint, stigma was one of the most interesting issues, especially when it comes to the workplace. He noticed the double disadvantage that occurs for people suffering from, not just disease, but also the associated stigma. He reminded us that EC President Junker said that Europe should not just have a financial AAA rank, but also a social one. 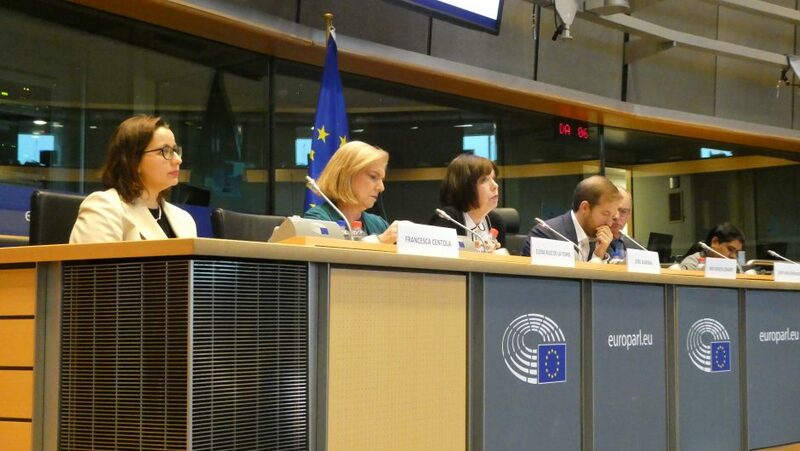 He added that this MEP Interest Group was successful, to date, because many politicians have not just come to talk, but to listen to the experts, including – most importantly – the patients, and then pushing for action. Therefore, he stressed his liking that the group would continue during the next mandate and build on this success. The subsequent speakers focused on the impact of Brain, Mind and Pain Disorders on Employment. Migraine as a first case study was discussed by Elena Ruiz de la Torre, Executive Director of European Migraine and Headache Alliance [EHMA] who started by introducing her organisation. She then explained that migraine is not merely a stronger headache but it is a real bio-neurological disease that affects some 160 million adults across Europe. It is also the second cause of years lived with disability world-wide. 2-7 working days are estimated to be lost from work by those with non-severe migraine annually. However, for those with chronic migraine, the number is much higher: up to 46 work days per year! Therefore, it has a huge impact on the professional and personal lives of those affected. It was noted that migraine is twice as common in women than in men, and is often most impactful during the most productive years of life. Ruiz de la Torre also discussed the Migraine at Work survey that was conducted in collaboration with the Spanish Occupational Practitioners Society. Over 3300 responses were received from employees with migraine from 8 EU countries. Key recommendations included adapting working arrangements; with measures such as flexible time, rest areas and teleworking. 85% of participants consider that a job facilitates social integration. The speaker finished by discussing how EMHA could support EFNA’s initiatives as well as informing about EMHA plans to create an interest group on migraine in the EP. One of the issues that the group would tackle is migraine and woman. More details can be found in the corresponding presentation. Joop van Griensven, President of Pain Alliance Europe followed by talking about Chronic Pain and the survey that they conducted in 2018. One of its most surprising outcomes demonstrated that public administration had one of the highest proportion of chronic pain patients, i.e. about 50%. Also more than 50% people reported that their condition prevented them from performing their work. Other topics dealt with issues such as drop of income which might be affected by stigma, an issue that deserves much more discussion and solutions. He concluded by declaring that PAE together with EFNA will continue to ask questions and help seek solutions for this major societal problem. Next speaker, Elisabeth Kasilingam, represented the European Multiple Sclerosis Platform of which she is the Managing Director. EMSP is a pan European NGO engaged in advocacy and awareness raising activities. She observed that the topics discussed at the meeting are very important for people with MS. In the past 10 years, EMSP conducted several editions of its MS barometer highlighting what the gaps and good practices are regarding disease management in Europe. Access to employment and social inclusion is specifically tackled in the barometer. She said there is a clear need for further education of employers. And, she stressed, it is important to align the health and social policies in the Member States. There is already much legislation but there is not enough alignment and implementation. This gap makes the life of people affected by MS more difficult. In 2015 the largest study with people affected by MS was conducted by Prof. G. Kobelt – “New insights into the burden and costs of MS in Europe”. It was observed that the work capacity of affected individuals declined from 82% to 8% in the years following diagnosis. Work hours, sick leave and productivity while working was measured in the study. The results confirm the importance of early intervention to change the disease course. It also supports the call for incorporating management of symptoms such as fatigue and cognition into routine clinical practice. Kasilingam stressed that it is clear that working together is the key. To this end a toolkit was prepared along with other documents and guidelines to support various aspects of MS management. Currently EMSP is working on promoting these various tools. Coming to conclusions, she reminded the audience that in many countries there is still no official definition of chronic disease and there is no common understanding about the concept of disability. We also need to highlight the reality of poverty, deprivation and social isolation due to being unemployed because of chronic illness. Finally, patients should be trained and empowered to take a more meaningful role in the decision making process. Financial support for national patient organisations is needed to provide capacity building training for patients, so that people with the chronic illnesses are present at decision-making level. 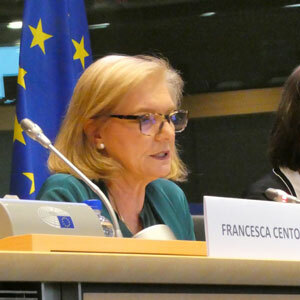 Francesca Centola, Project Officer at Eurocarers took over. Eurocarers is the European network of carers’ organisations and research institutes with members in 27 European countries. She explained that an informal carer is any person who provides care – usually unpaid – to someone with a chronic illness, disability or other long lasting health or care need, outside a professional or formal framework. 80% of care is provided by informal carers. The economic value of informal care in EU is between 50% and 90% of overall formal long term care costs. There is a significant gender gap in terms of the level of involvement with most of the care provided by woman. She then talked about combining care and paid work. Usually informal carers would prefer to combine care and employment, although this often proves to be challenging. It is also in the interest of companies to allow employees to combine these two as there is a strong business case for it. The cost of inaction is much higher than a cost of intervention. She then explained how informal carers can be supported. Being a carer should be a matter of choice. For the choice to be genuine, there needs to be the provision of formal long-term care services, of good quality and affordable. In addition to this pre-condition, a set of support measures can be put in place, such as care leave, flexible working arrangements, pension credits for time spent providing unpaid care. The need to support carers with both access to services and work-life balance measures is gaining momentum at EU level. The European Pillar of Social Rights affirms the right to affordable long-term care services of good quality (Principle 18), as well as the right to suitable leave, flexible working arrangements (Principle 9). The ‘Work-Life Balance’ Directive introduces a care leave of 5 days/year. She finished by informing participants that Eurocarers has recently launched a European Strategy, which indicates the 10 key actions to implement a carer-friendly policy environment seeking to recognise, support and empower informal carers across Europe in a comprehensive and coherent manner. Leaners found the presentations very informative. He said that awareness and empowerment seemed to be resurfacing and clear recommendations were very helpful to receive during presentations. He then wondered if we have some good practices from EU countries, as the EU can be a platform for sharing and disseminating best practice. He also noted that it was valuable to hear the perspective of people directly affected – the patients and the carers. An issue was raised from an audience regarding applying for jobs with chronic illness. For part time jobs, employers ask why young people want to work part time. Applying for jobs can be scary for young people. Chronically ill people should be seen as people and not patients. Patients should be seen as being valuable additions for organizations. It is not only difficult to be functional at job – getting a job is also challenging and should be addressed. Another comment was made about many neurological diseases that create deficits that are often not seen. J. van Griensven said that raising awareness and education is key here – people should know what to do as many of them are/will be affected by chronic diseases. In this regard the role of unions was raised by one of participants and in which way chronically ill patients can fall back on unions. E. Kasilingam said that HR departments were involved in their work but unions should also be considered. Emmanuelle Grange, Head of Unit, Disability and Inclusion in DG Employment and a keynote speaker was then asked to comment on whether these recommendations were steps in the right direction and how they can they be taken forward. Ms. Grange answered that the direction is right and political pressure needs to be maintained. 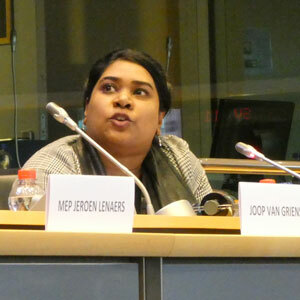 She explained that in the European Commission is in charge of mainstreaming disability in all EU policies. As such her unit coordinates work with other Directorate Generals. She continued by saying that sickness cannot always be assimilated to disability according to the jurisprudence of the European Court of Justice. Therefore, applying legislation on disability in the field of brain, mind and pain disorders cannot be systematic as there is no EU definition of disability and the recognition of disability by member states differs hugely. She stressed that awareness raising campaigns are very important. In terms of EU competences, sometimes legislation can be made, but equally Member States competences need to be kept in mind. The Directive has been well transposed by Member States. However, the Commission receives various complaints regarding individual decisions taken by social security systems. Disability complaints are present in this group too. The answer that the EC mostly gives is that unfortunately it cannot deal with it as it is national competences. She informed the audience that a common report is under preparation with DG Justice on the implementation of three non-discrimination directives. An awareness raising campaign on these three directives will take place in early summer until the second half of 2020. It will be a general campaign dealing with all aspects related to non-discrimination. A specific part of this campaign will deal with disability and reasonable accommodation and will be related to employers. She added that there are often a lot of misunderstandings regarding reasonable accommodation. Therefore, seminars will be organized in Member States and guidelines will be discussed and shared with employers. Grange remarked that the implementation of the Pillar is one of the big challenges of the coming years. Nonetheless, there is also a strong will of the current EC for the Pillar to be implemented, first by the Member States. She stressed that it’s also a job of civil society to push for it and remind Member States about it. Grange informed participants that DG EMPL started to assess the current 2010-2020 strategy, which is a long process. While the strategy could always be further improved, it does have positive results already. Public consultations will be run to assess it further. She then asked for an active participation and spreading of the word – it is important to have many replies to show to the EC that this matter matters to the citizens. She added that constructive criticism is welcome too. A new strategy 2020-2030 will have to be discussed in 2020, taking into account issues such as the Sustainable Development Goals. It is to be seen if more could be done in areas of health and employment. Grange said that DG EMPL hopes that on 13 March the European Parliament will vote positively in which case the Council could adopt it in April. This would open the doors for its transposition and then implementation in the Member States. The future programme Invest EU could be also an option to be considered. It brings together, under one roof, the multitude of EU financial instruments currently available to support investment in the EU, making EU funding for investment projects in Europe simpler, more efficient and more flexible. A question was made from the audience concerning existence of guidelines related to self-employed people who are also discriminated when being ill. E. Grange answered that EC has just adopted recommendations on Social Protection for All including self-employment, ensuring that there is a minimal safety net. Jaarsma stressed that the patients voice should be loud and clear in all of the plans outlined above. She then handed over to J. van Griensven who concluded by remarking that, on one hand, there were a lot of interesting presentations but on the other, limitations could be observed in areas such as implementation. He added that, nonetheless, it is encouraging because we all work on these issues as patient organizations and policy makers. With the EU elections coming up, he urged everyone to give their vote to people that support our cause. He also found it encouraging to hear DG Employment saying that they are working together as this is the only way to find solutions to problems that span across many policy areas. Previous article Future of Healthcare in Europe – What next for brain, mind & pain?